Take the BART to the Downtown Berkeley station. Exiting the station at the main escalators, cross towards the Bank of America and then turn left and walk to in front of the Scandinavian Designs / Sandwich Zone storefronts, where you can catch the UC Berkeley "Perimeter Line" or "Central Campus" bus to the Hearst Mining Circle on campus, and there transfer to the"H" (Hill) bus to MSRI. * This bus is free for UC Berkeley or MSRI ID holders, and all other visitors must pay $1 per ride, cash only. * Please note that due to ongoing campus construction in Spring 2019 (end date TBD), the Central Campus line is temporarily out of service. 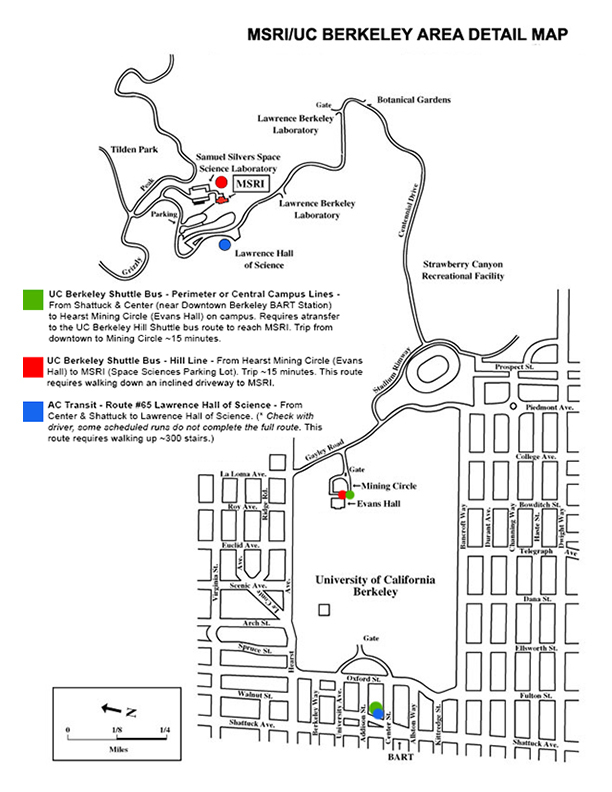 UC Berkeley has added additional Perimeter Line shuttles to accommodate passengers. On Saturday, Sunday and holidays you can use the AC Transit service, bus #65 between Berkeley BART and Lawrence Hall of Science via Euclid Ave. and Grizzly Peak Blvd. There is an hourly service Saturday and Sunday, and a half hour service weekdays (Eastbound from Bart to MSRI, and Westbound from MSRI to Bart). Please check the AC Transit website for up-to-date information about bus stop locations, due to construction projects in downtown Berkeley. For more information on public transportation in the Bay Area, visit 511.org. To get a public transit pre-paid fare card or monthly passes, you may be interested in the Clipper Card, which works for BART, AC Transit, and many other Bay Area public transit options. Clipper Cards can be purchased at several downtown Berkeley retailers (including Walgreens) as well as at select BART stations.